Missing or damaged teeth can cause embarrassment and pain. 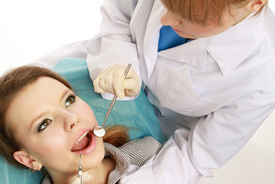 With full mouth reconstruction procedures, you don't have to suffer! A full mouth reconstruction treatment plan may include several dental treatments designed to restore your mouth to its former health, function, and beauty. The professionals at Plymouth General Dentistry offer a wide variety of restorative dental procedures to improve the look and function of your teeth. Here are just a few of the most popular full mouth reconstruction treatments offered at our Plymouth cosmetic dentistry practice. The treatments used in each full mouth reconstruction vary depending on the needs of each patient. Many full mouth reconstructions require multiple procedures to completely transform the smile. Full mouth reconstruction procedures range from the purely cosmetic, like teeth whitening, to restorative treatments, like dental implants. The following are some of the most popular restorative treatments used in full mouth reconstructions. Porcelain Crowns: Teeth that are broken, cracked, or weakened by large fillings can be treated with porcelain crowns. Porcelain dental crowns are tooth-shaped caps, which are designed to encase a damaged tooth to restore both look and function. Inlays and Onlays: Inlays and onlays are tooth-colored restorations designed to replace metal fillings and repair damaged molars. Inlays are smaller than onlays and are used to repair cavities within the cusps of the back teeth. Onlays are used when the dental damage extends beyond the cusps; onlays are also called partial crowns. Porcelain Veneers: Porcelain veneers are thin, tooth-shaped shells that are bonded to the front teeth to improve the shape, size, spacing, and shade of the teeth. Porcelain veneers can also be used to repair minor damage like small cracks and chips. Dental Crowns: Dental crowns can be attached to dental implants to replace individual teeth. This type of restoration is best suited to patients that are missing a single tooth. Implant-supported Bridges: An implant-supported bridge is best suited to patients that need multiple replacement teeth. Implant-supported bridges attach to one or two dental implants to replace three or four consecutive teeth. Implant-supported Dentures: For those missing a full set of bottom, top teeth, or both, implant-supported dentures are a great option. Implant-supported dentures use three to five dental implants to anchor a set of special dentures within the mouth. This eliminates the need for messy adhesives and ensures a secure, comfortable fit. Don't wait any longer to restore your teeth to their former health and beauty. Schedule your full mouth reconstruction appointment today!